Reserved until March 25 ? The last reservation of this item will conclude on March 25. For rentals that require shipping or a pickup at a non-headquarter location, please select a later date for your arrival. Headquarter offices are the only locations that can accept a same-day reservation, as transit time is not calculated in this date. The Street Photography (Compact) Essentials Package - Olympus features the gear you need to help kickstart your venture into street photography. 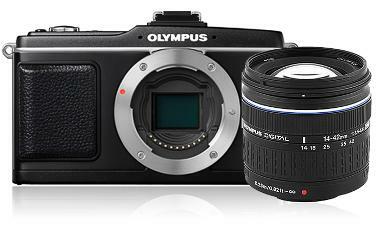 The Olympus E-P2 Pen Digital Camera is the camera that answers the prayers of folks who want a small, light camera with advanced DSLR-like features such as interchangeable lenses. Able to shoot both stills and video, has in-camera stabilization, integrated sensor cleaning, shoots up to ISO 6400, and offers a 3" LCD. The Olympus ED 14-42mm provides a standard "walk around" focal length for four-thirds cameras, equaling 28-84mm, extremely compact and light, allowing you to carry it all day without strain. A SD memory card is not included. We make every attempt to have a fully charged battery, but can not guarantee it. If you need a fully charged camera body, please request it via order notes.